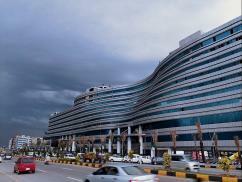 The corporate office is available on rent in GIGA MALL (WORLD TRADE CENTER). WORLD TRADE CENTER is the only tower in Pakistan which is internationally recognized, provides you with an excellent & comfortable environment for your business, where you can deal your client Confidently, Satisfactorily & Safely. Moreover, food court, Shopping Malls & staying points are also available right along with your tenancy. I am interested in your property Reference No. with title 'Ideal Location WTC Office Available For Rent'. Please send me further details. Thank you.